This is one of the buildings, which initially may cause confusion for travelers: why it stands alone in the park and what makes it unique, because it is small, inconspicuous in comparison with other monuments of architecture. 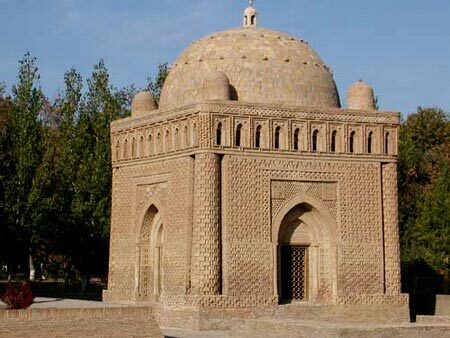 But the Samanid mausoleum is famous not for its architectural features, and contrary to them. It was erected between 892 and 943 years by the great ruler, Ismail Samani, who was the founder of the Samanid state capturing Bukhara in 874 for his father, Ahmed ibn Assad. Subsequently, Ismail Samani and his grandson were buried in this mausoleum. In the XIII century, during the invasion of armies of Genghis Khan, the locals filled the mausoleum up with sand, creating a huge dune. So this building was saved for the first time. And her plain architecture was the evidence of late architecture of worshipers, which underwent the changes under the influence of Islam. Terra-cotta building is the cube, tapering to top, which is crowned by rather large spherical dome. For thousand years of history the Samanid mausoleum went to seed, a cemetery was formed around it and up to 1920 it was buried by a third in the cultural layer, the dome was partially destroyed, and the local clergy used the sarcophagus of the ruler for divination: two holes were made in the cover, one at feet, the other near the head. Questions were placed into the first hole, and the "answers" were taken from the second. Today, the Samanid mausoleum is the evidence of early Islamic and late Zoroastrian culture, which has become almost the only transitional building in the history of Bukhara.